The Grand Theatre & Hippodrome was opened in early-1908 as a variety theatre. Designed by the architectural firm Prescott & Bold of Wigan, it had a 32 feet wide proscenium, and a 39 feet deep stage, with six dressing rooms. Within months of opening it was presenting cine-variety. Eventually, after live shows ceased, a projection box was built on the stage, and films were projected via rear projection. In 1939, the interior was completely re-modeled in and Art Deco style, to the plans of architectural firm Gray, Evans & Crossley of Liverpool. Taken over in 1945 by Circuits Management Association(CMA) later to become the Rank Organisation, it was re-named Odeon. It was sold to the Classic Cinemas chain in December 1967, and was re-named Classic Cinema. Converted into a twin screen cinema in the mid-1970’s, seating was provided for 392 seats (using the rear projection box) and 228 seats in the former circle (using a newly built projection box). 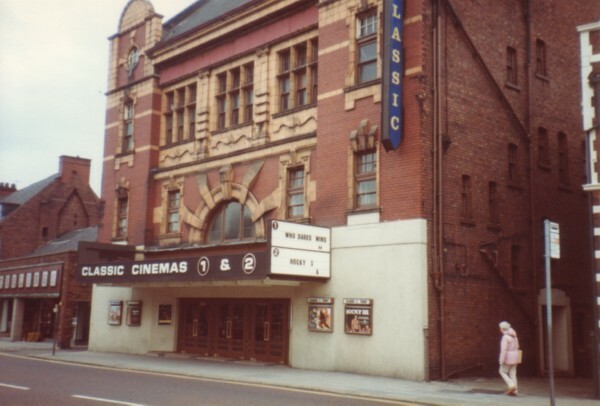 In 1984, Classic Cinemas were taken over by the Cannon Group and the cinema was re-named Cannon. It was closed on 6th October 1989. Plans were approved for the building to be converted into a church, but this never happened and it became a Lazer-Quest game centre. This closed in 1995, and in 1996, plans were proposed to convert the building into an arts centre. Again, nothing came of this plan, and it became a live music venue. Since June 2007, it has been converted into a pub for the J.D. Wetherspoon chain, known as The Thomas Burke. Thanks Ken for all the theatres and pictures most of us will never get to see in person with our cameras.